Okay, speaking about my favourites, that are not for eating or drinking purposes (rather becoming beautiful purpose), I’ve been raving about how amazingly Naked2 palette works with my new ‘Diva’s Lashes’ mascara by Pupa. While the eyeshadows define my eyes, the mascara makes my lashes not only crazy long, but extremely fluffy too. Love! For my highlighter (and eyeshadow) I’ve been loving Sephora’s Urban Luxe Powder, which is a great multi-functional product. It’s on sale now, so hurry up, if you’d like to get it. It’s such a good product for only $7. My last three favourites are my gorgeous new Paul’s Boutique bag, that has dollar, diamond and crown print on it, chunky gold watch also from UK high-street brand Paul’s boutique, and studded booties from River Island. I got the booties in the end of November, but I fell in love with them immediately – they are cute, comfy and edgy. 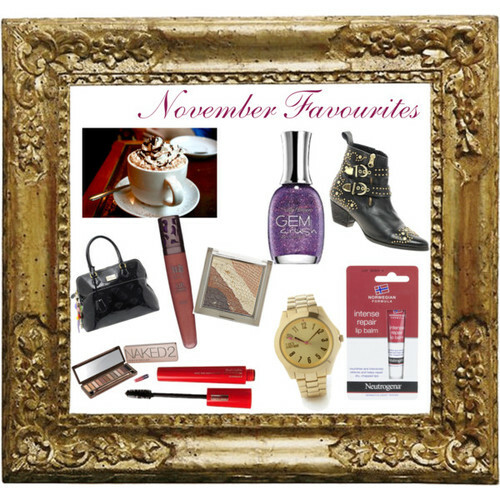 These are pretty much my November Favourites.